LASIK is eye surgery that permanently changes the shape of the cornea (the clear covering on the front of the eye). It is done to improve vision and reduce a person's need for glasses or contact lenses. For clear vision, the eye's cornea and lens must bend (refract) light rays properly. This allows images to be focused on the retina. Otherwise, the images will be blurry. This blurriness is referred to as a "refractive error." It is caused by a difference between the shape of the cornea (curvature) and the length of the eye. 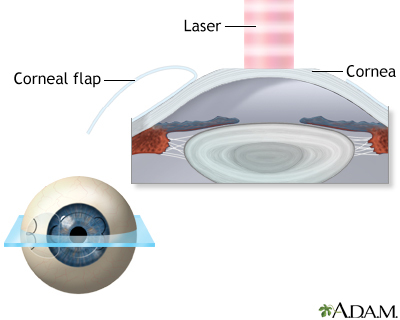 LASIK uses an excimer laser (an ultraviolet laser) to remove a thin layer of corneal tissue. This gives the cornea a new shape so that light rays are focused clearly on the retina. 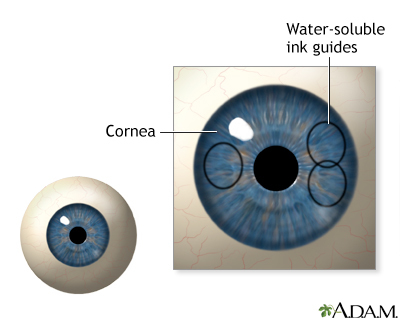 LASIK causes the cornea to be thinner. LASIK is an outpatient surgical procedure. It will take 10 to 15 minutes to perform for each eye. To do the procedure, a flap of corneal tissue is created. This flap is then peeled back so that the excimer laser can reshape the corneal tissue underneath. 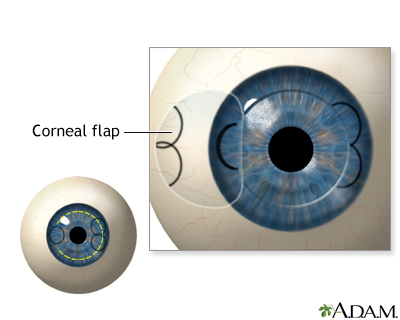 A hinge on the flap prevents it from being completely separated from the cornea. When LASIK was first done, a special automated knife (a microkeratome) was used to cut the flap. Now, a more common and safer method is to use a different type of laser (femtosecond) to create the corneal flap. Once the reshaping is done, the surgeon replaces and secures the flap. No stitches are needed. The cornea will naturally hold the flap in place. LASIK is most often done on people who use glasses or contact lenses because of nearsightedness (myopia). It is sometimes used to correct farsightedness. It may also correct astigmatism. The FDA and American Academy of Ophthalmology have developed guidelines for determining LASIK candidates. You should be at least 18 years old (21 in some cases, depending on the laser used). This is because vision may continue to change in people younger than 18. A rare exception is a child with one very nearsighted and one normal eye. 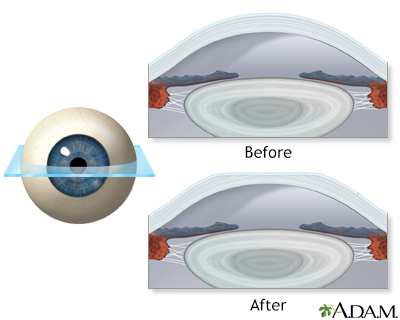 Using LASIK to correct a very nearsighted eye may prevent amblyopia (lazy eye). Your eyes must be healthy and your prescription stable. If you are nearsighted, you should postpone LASIK until your condition has stabilized. Nearsightedness may continue to increase in some people until their mid to late 20s. You should be in good general health. LASIK may not be recommended for people with diabetes, rheumatoid arthritis, lupus, glaucoma, herpes infections of the eye, or cataracts. You should discuss this with your surgeon. Weigh the risks and rewards. If you're happy wearing contact lenses or glasses, you may not want to have the surgery. For people with presbyopia, LASIK cannot correct vision so that one eye can see at both distance and near. However, LASIK can be done to allow one eye to see near and the other far. This is called "monovision." If you can adjust to this correction, it may eliminate or reduce your need for reading glasses. In some instances, surgery on only one eye is required. If your doctor thinks you're a candidate, ask about the pros and cons. You should not have this procedure if you are pregnant or breastfeeding, because these conditions can affect eye measurements. A complete eye exam will be done before surgery to make sure your eyes are healthy. Other tests will be done to measure the curvature of the cornea, the size of the pupils in light and dark, the eyes' refractive error, and the thickness of the cornea (to make sure you will have enough corneal tissue left after surgery). You will sign a consent form before the procedure. This form confirms that you know the procedure's risks, benefits, alternative options, and possible complications. You may have burning, itching, or a feeling that something is in the eye. This feeling doesn't last for more than 6 hours in most cases. An eye shield or patch will be placed over the eye to protect the flap. It will also help prevent rubbing or pressure on the eye until it has had enough time to heal (usually overnight). It is very important NOT to rub the eye after LASIK, so that the flap does not dislodge or move. For the first 6 hours, keep the eye closed as much as possible. The doctor may prescribe mild pain medicine and a sedative. Vision is often blurry or hazy the day of surgery, but blurriness will improve by the next day. Call the eye doctor right away if you have severe pain or any of the symptoms get worse before your scheduled follow-up appointment (24 to 48 hours after surgery). At the first visit after the surgery, the eye shield will be removed and the doctor will examine your eye and test your vision. You will receive eye drops to help prevent infection and inflammation. The health care provider will give you specific instructions. Most people's vision will stabilize in a few days after surgery, but for some people, it may take up to 3 to 6 months. A small number of people may need to have another surgery because the vision is over- or under-corrected. Sometimes, you will still need to wear contact lenses or glasses. Some people need a second surgery to get the best possible results. Although a second surgery may improve distance vision, it may not relieve other symptoms, such as glare, halos, or problems with night driving. These are common complaints following LASIK surgery, especially when an older method is used. These problems will go away by 6 months after the surgery in most cases. However, a small number of people may continue to have problems with glare. Probst LE. LASIK technique. In: Mannis MJ, Holland EJ, eds. Cornea. 4th ed. Philadelphia, PA: Elsevier; 2017:chap 166. Sierra PB, Hardten DR, Davis EA. LASIK. In: Yanoff M, Duker JS, eds. Ophthalmology. 4th ed. Philadelphia, PA: Elsevier Saunders; 2014:chap 3.5.